The Costa del Sol (literally, "Coast of the Sun"), the part of the Spanish southern coast belonging to the province of Malaga, has a Mediterranean climate, with mild, relatively rainy winters and hot and sunny summers. 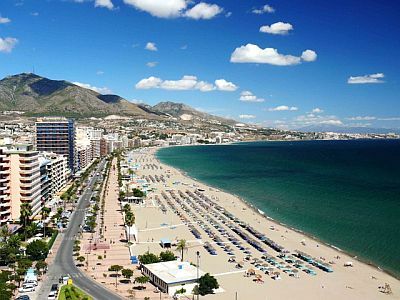 There are towns like Estepona, San Pedro de Alcántara, Puerto Banús, Marbella, Fuengirola, Mijas, Benalmádena, Torremolinos, Málaga, Velez-Málaga, Torre del Mar, Torrox, Nerja. The wind blows frequently: not by accident, in the past the Costa del Sol was called Costa del Viento ("windy coast"). In the cold half of the year, the wind blows with Atlantic disturbances, while in summer it blows as sea breeze in the afternoon. In the westernmost part (see Estepona), in summer the Levante, the cool wind from the east, can blow, though less frequently than in the province of Cadiz. Here are the average temperatures of Marbella. Rainfall is not abundant, and follows the Mediterranean pattern, in fact most of it falls from October to March (in autumn and winter it can sometimes rain a lot, especially in the western part), while in summer it almost never rains. Also, rainfall becomes gradually less abundant proceeding from west to east: the average ranges from 690 millimeters (27 inches) per year in Estepona, to 585 mm (23 in) in Marbella, to 525 mm (20.5 in) in Málaga, to 450 mm (17.5 in) in Nerja. This is the average rainfall in Marbella. Winter, from December to February, is mild and is characterized by sunny periods alternating with periods of bad weather, with wind and rain. When the sky is clear, at night the temperature can go below 5 °C (41 °F), while during the day it is mild, above 15 °C (59 °F). Very cold days are rare: only in the coldest nights the temperature can go down to freezing, but even in these cases, usually during the day it rises above 10 °C (50 °F). In practice, it never snows or freezes. Spring, from March to May, is mild and sunny, with rainy days still possible, but not very frequent. Starting from May, and sometimes already in April, the first hot days can occur, with highs around 30 °C (86 °F). Summer, from June to mid-September, is hot and sunny. Typically, temperatures hover about 27/28 °C (81/82 °F) in June and September, and about 30 °C (86 °F) in July and August, the weather is hot and muggy, but the sea breeze blows, in short, the typical Mediterranean summer. However, when the wind blows from the interior of Andalusia, the heat can be intense, in fact the temperature can reach 35/37 °C (95/99 °F) and sometimes up to 40 °C (104 °F); fortunately in these cases there's a moderate wind and the air becomes dry: it's better to drink often to avoid dehydration. Autumn, from mid-September to November, is initially warm, and then becomes gradually milder, while Atlantic fronts become gradually more frequent. In October, there are still many warm and sunny days, especially in the first half. By November, we are well into autumn, in fact the weather is mild, but it's also often cloudy and rainy. Sometimes the rains are concentrated in a short time and be heavy, particularly in the western part. The amount of sunshine in the Costa del Sol is very good in summer, when clear skies prevail, it is good in spring, when, however, cloudy periods are still possible, while it is decent in autumn and winter, when in addition to sunny periods, cloudy and rainy days occur quite frequently. Here are the average daily sunshine hours in Málaga. The Alboran Sea is never very warm to swim in because of infiltration of water from the Atlantic Ocean, in fact it is still very cool in June, when the water temperature is about 20 °C (68 °F), then it rises to 22 °C (72 °F) in July and September, and reaches 23 °C (73 °F) in August, when it becomes acceptable for swimming. The best time to visit the cities of the Costa del Sol, for walks and hikes, corresponds to the months of April, May and October, especially if you plan an excursion to the interior of Andalusia, which in summer is often scorchingly hot. For a beach holiday, the best period is instead the summer, from June to mid-September. In the westernmost part, it's better to bring a sweatshirt for cool and windy evenings, especially in June and September, but for safety also in July and August.